Had to go somewhere for my week out from the Bend-Sunriver Thousand Trails park so I found Cascade Meadows RV Park in La Pine, OR to stay at cheap with my Coast to Coast and RPI memberships. It’s nice to be in a wide open park with lots of grass and no trees for a change of scenery. No problem getting satellite TV there and they provide free Wi-Fi which is a nice break for my Verizon cell internet though that does work there. The staff are very nice and helpful. The clubhouse is minimal. The pool is an excellent warm temperature. The hot tub is out of order. Kind of a mixed bag there but the full hookups were nice after two weeks of no sewer hookup and it is located right on Paulina and East Lake Rd. 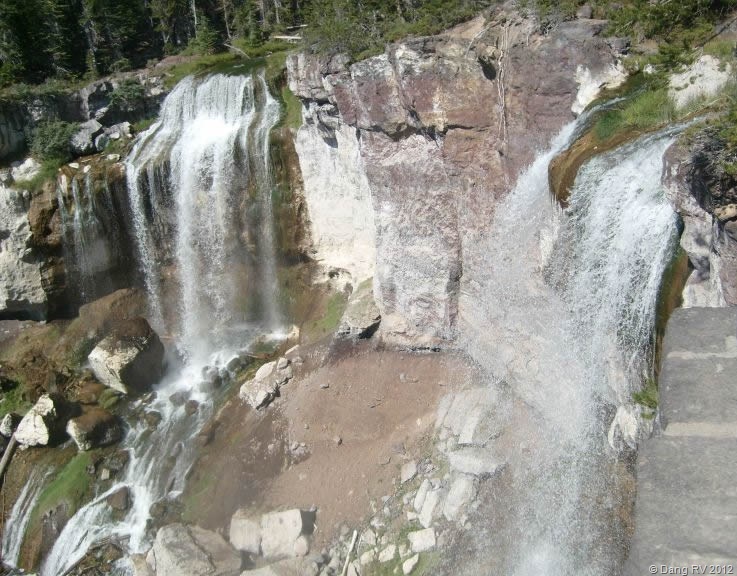 which goes up to the volcano caldera and obsidian flow I wanted to see. It is up against Highway 97 so there is traffic noise and even a train somewhere nearby but neither of those bothered me in my rig or woke me up. All the sites are 70 foot pull-thrus which is also nice. I would stay there again despite the highway noise. First chance I had, I went up to the caldera and drove around in the volcano. 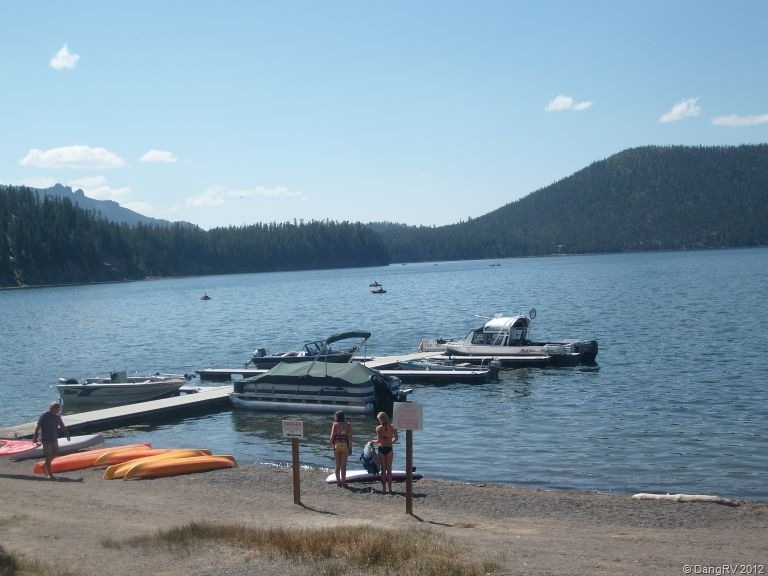 The lakes are very popular for camping, boating, and fishing. Watch out for the signs when driving because they don’t put arrows on them to tell you to turn. 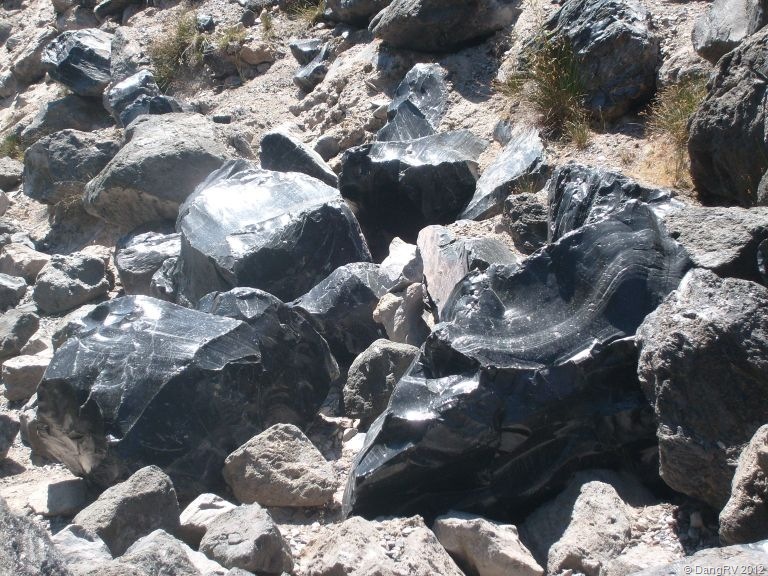 I went up to the obsidian flow fully expecting to walk out on a huge, smooth piece of stone. 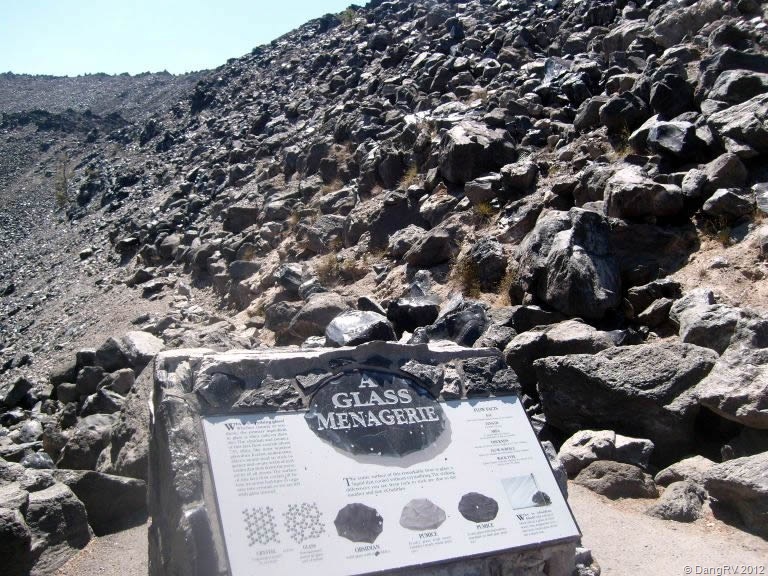 Instead, it was bunches of pieces of obsidian and pumice piled high across the landscape. A narrow trail with informational signs along it takes you up through it. Be careful as obsidian is very sharp like glass. Indians used to carry a chunk of it around in case they needed to cut something or fashion a tool or arrowhead. It was a bit of a hike but a great view of the lake and flow. I’m still paying for the exertion several days later though. I also went to Paulina Falls up there to get a picture for a friend. The multiple waterfalls were much better than I expected! The falls look absolutely fantastic. Were there any places where you could possibly swim in the pools? There is a lower trail but I didn’t go on it or see anywhere to swim. You want some great river and waterfall swimming, go to Fall Creek Falls State Park in Pikeville, TN. That place is awesome!